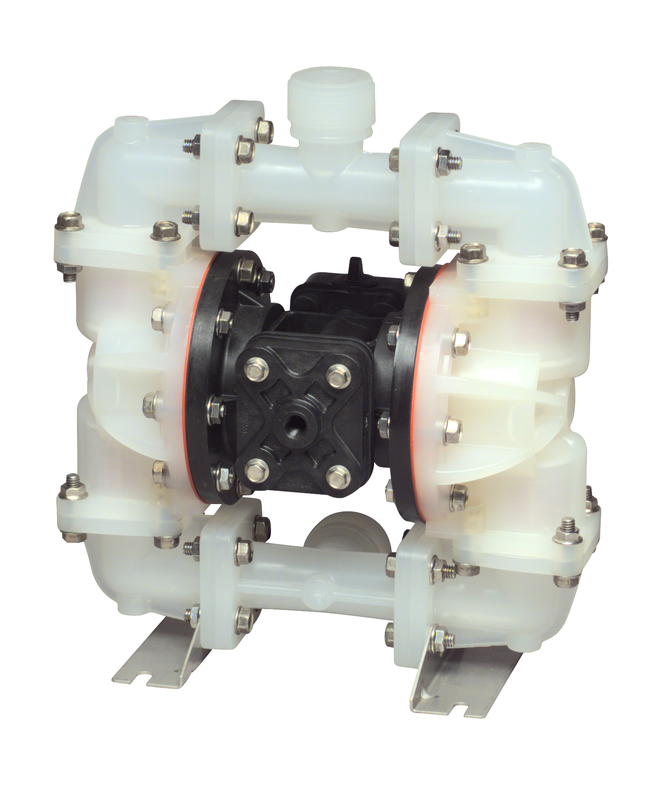 Air Operated Double Diaphragm (AODD) pumps are an interesting seal-less, displacement alternative to centrifugal pumps. They are extraordinarily good ‘all-rounders’, finding applications in a wide range of industries, including construction, mining, electronics, chemicals and food processing. The pumps are self-priming so they can run dry without any damage and because they are powered entirely from compressed air, they are ideal for use in remote or hazardous locations, not to mention explosive environments. They require low amounts of maintenance and offer low cost of ownership, completing an attractive package. The pumping of waste fluids is an important requirement in a host of different industries and liquid waste can frequently contain varying amounts of solids, from sludge, slurries and solids in municipal and industrial waste applications, to slurries laden with rocks, pebbles and other particulates in the mining industry. Air Operated Double Diaphragm pumps triumph over other pump designs, such as those with close-fitting or rotating mechanisms where abrasive slurries can cause serious wear to functioning parts. As a result this can cause significant restoration costs and in many cases suspend productivity. Due to the size and make-up of AODD pumps, these issues rarely occur. Of course AODD pumps are not restricted to pumping waste containing solids; they are equally well suited to pumping other types of waste, including aggressive chemicals and even viscous fluids since the flow rate is directly proportional to the speed of the pump. For this type of application, AODD pumps differ from other pump types in that they automatically reduce the pumping rate as the level of viscosity increases. They also cleverly stop pumping when the liquid can no longer move in order to stop the potential of damaging itself. Other pumps struggle with viscous materials and can lose friction within the pump itself as well as between the walls of the pipe and the liquid. In order to better understand the many benefits offered by AODD pumps, it is worth examining the way that these pumps work. Fig. 1. shows how the two diaphragms in the pump (A and B) are moved from left to right and back again by directing compressed air alternately to them via a central air valve. The movement of diaphragm A towards the centre of the pump generates a partial vacuum in the chamber, causing ball valve 1 to close while ball valve 2 opens as air pressure forces liquid from the inlet (‘I’) into the chamber. At the same time, diaphragm B compresses the volume in its chamber, which closes valve 3 and forces fluid past valve 4 and out through the outlet port (‘O’). When the air valve reverses the movement of the diaphragms, fluid is pumped via the left hand side of the pump. The diaphragms are clamped to the walls of the pumping chamber so there are no sliding seals in the pump. The diagram shows the flow of liquid from the bottom to the top, however alternative designs allow liquid to flow from the top to the bottom of the pump or even through the centre of the pump, which can lead to smoother flows. AODD pumps contain fewer moving parts than many other types of pumps and are simple to set up. There are no shaft seals or packing boxes involved. The diaphragm is a dynamic seal that converts the pneumatic pressure on one side to a fluid pressure on the other (the medium to be pumped). Discharge flow rates are adjusted by controlling the air inlet, so no complex control systems are required. Waste fluids are frequently stored in containers, and may then have to be transferred to other containers, such as a tanker, for removal from site. AODD pumps are well suited to this type of application because they are inherently dry self-priming. This means they are capable of drawing up liquid even when installed above the source liquid level, unlike centrifugal pumps which require an initial charge of liquid. Another great benefit of AODD pumps, in regard to the self-priming feature, is its ability to act as a ‘scavenger’. By attaching a hose to the inlet, the pump can function as a type of vacuum cleaner to clear out and completely empty drums, barrels and other containers. This cost-saving aspect of the pumps adds real value to the end user. Unlike most centrifugal and displacement pumps that fail if they run dry, AODD pumps have the ability to run faster without damage when operating dry. Furthermore, air shut-off valves can also be added in order to reduce the amount of compressed air wasted whilst running dry. The versatility of this pump type, and range of applications that can be accommodated is due in no small part to the wide range of materials than can be used in the construction of both for the pump body and the diaphragms. The diaphragm is literally the heart of the pump. 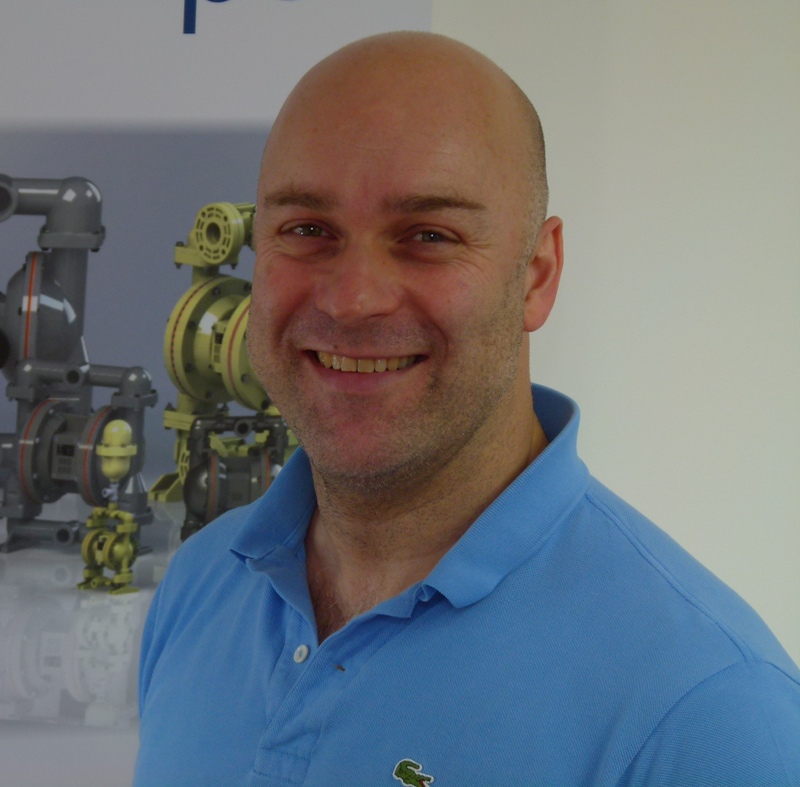 Key factors to take into account when determining the suitability of a diaphragm pump for certain applications are the materials that need to be pumped, the temperature in which they are to operate, the potential effect on the equipment and of course the flex life of the diaphragm. Various rubber components are used in the manufacture of diaphragms and a nylon fabric mesh is used for dimensional stability and additional strength. Elastomers such as Neoprene, Buna-N, EPDM, (Nordel) and Viton are the most frequently used. Their chief characteristic is flexibility which allows more volume to be displaced. Thermoplastic materials are also available for manufacturing diaphragms. These are produced by an injection moulding process and require no fabric reinforcement for dimensional stability or tensile strength. The most popular are polyurethane, Hytrel, Santoprene and Teflon. Polyurethane gives excellent general purpose diaphragms which are the most economical of all, with extremely good flex life. Derivatives of the above materials have also been developed by individual pump manufacturers for use in their own pumps. Despite Teflon having very little elasticity, which can reduce flow rate by up to a fifth, an additional rubber back-up diaphragm can provide extra flexibility and memory. PFTE diaphragms have been developed to boost flexibility, memory and also flow rates. Single piece diaphragms where the PTFE diaphragm is bonded directly to a rubber diaphragm are also available to combine the chemical resistance of PTFE with the flex characteristics of an elastomer. If a plant isn't suitably designed for the application of an AODD pump, the pump could end up costing more to run than it should. Having said that, the cost of ownership of the pump itself can be broken down into investment and installation costs, maintenance and upkeep costs including labour and spares, energy costs as well as waste removal and disposal costs. Purchase costs will naturally depend on the size of the pump and the materials of manufacture, but with many manufacturers to choose from, the prices tend to be competitive. However, installation costs are minimal since pumps can be positioned wherever there is adequate space for them, even submerged if the liquid is compatible with the material of the pump and the exhaust is ported out of the liquid. Additional costs may arise if pulsation dampeners are required to accommodate vibrations and surges in the piping systems. AODD pumps are very reliable since they have very few moving parts and components that can wear. They are easily dismantled for maintenance or diaphragm replacement. The main working parts are the valves, valve seats and diaphragms. Spares are generally fairly low cost, but it is vital to select the correct corresponding parts. For example, Neoprene is outstanding for general purpose as a low cost diaphragm that delivers the highest flex life. Teflon-based diaphragms are generally the most expensive, with other materials lying in between, so while the diaphragm used must be compatible with the fluid to be pumped, care should be taken to make sure that it is not ‘over-specified, leading to unnecessary costs. Energy costs for the pump comes from the consumption of the compressed air required to power the pump. Since compressed air is a relatively costly utility in many plants, requiring compressors and air distribution systems, this represents the main running cost for an AODD pump. However, AODD pumps can be used in locations where either electricity simply isn't available or in hazardous areas where electrical supplies are restricted. This enables AODD pumps greater flexibility over centrifugal and positive displacement pumps. AODD pumps are generally environmentally friendly as most of them use oil-free compressed air for pollution-free operation. No oil mist is vented into the atmosphere and also there can be no oil contamination of the pumped fluid. Since there are few components that require maintenance, it is relatively straight forward to refurbish AODD pumps, increasing their lifetime and further decreasing cost of ownership. As already mentioned, there is a huge choice of AODD pumps from a large number of manufacturers, so it can be useful to consult with independent pump suppliers, who are not tied to a particular manufacturer, for advice on the most suitable pump for a given application within the allocated budget. David Rozee is with Triark Pumps.